We live an exciting moment, one of those moments that are experienced from time to time throughout history when the modes of production change and everything that had up to that moment is modified. Industry 4.0, also called the fourth industrial revolution, takes us to a new technological and business model. A faithful reflection of this reality, many of the innovations that have been presented throughout the year in the meat sector are based on the concepts that in turn support industry 4.0: digitization, virtualization and automation. However, a detailed analysis shows us something that also has great interest. We talk about the very characteristics of the meat sector, still very fragmented, with a large presence of SMEs, of traditional model, which is sustained from the experience of work for decades. This means that, together with the most advanced technology associated with what will be the future of the industry, many companies live in the present offering services, machinery and utensils that are based on the same principles in production as in previous decades. We begin the review of the facilities. Without a doubt, we are living a continuous process of change and adaptation to the new times with increasingly modern and technologically advanced facilities that, in turn, allow us to produce sustainably, efficiently and with maximum food safety, and also , for workers. A-Safe has introduced a new curb designed to provide protection at ground level to walls, buildings and equipment. During the last edition of Empack Logistics, the manufacturer of industrial doors and logistics equipment Angel Mir - Portes Bisbal SL , & nbsp; introduced the new Led Guide system to improve the safety and effectiveness of the loading and unloading dock. Ulma Architectural Solutions installs both polymer and steel concrete channels stainless and industrial sockets. In stainless steel, it offers Blücher products for the agri-food industry, such as sinks, modular channels and pipes, among others. Vibrofloors presented its industrial ceramic flooring by offering and choosing products that meet all the necessary specifications of the food industry, thus satisfying the needs of each client. From the point of view of energy efficiency, Solar Plug & nbsp; offers the possibility of optimizing the energy resources of companies with a clear orientation towards photovoltaic self-generation. They provide energy solutions, always oriented towards sustainability and renewable energies. Also in efficiency focuses its actions Escan , which leads in Spain the Steam-Up project , with actions to optimize steam systems, improving efficiency, maintenance and energy management systems with the aim of detecting viable improvements, using specialist knowledge and facilitating savings of systematic energy. It is undoubtedly one of the pillars of the so-called industry 4.0 and something that is already being implemented in much of the national meat industry. The processes are increasingly automated and robots are increasingly integrated into the production chain. Stäubli launched the new series of robots at the Munich fair Scara TS2, which was presented worldwide. Thanks to the incorporation of the technology of reducers JCS, the redesign of the robots of four axes offers a few times of cycle very short to what joins his revolutionary hygienic design that opens new possibilities of use in sensitive environments. Mach is the next generation system developed by Tecsal for the automatic transport of hangers in track systems. Marel Meat has introduced this year the TrayTrack system & nbsp; consisting of aerial conveyors with tray carriers, stations automatic loading and unloading of trays and electronic controls for the programming and operation of the system. The gearmotor Freund GMB33-08 is specially designed for automation and robotics. Digitization is the other pillar on which the industry 4.0 is based and its development in recent years is motivating the great transformation of factories towards what is called smart factories. The use of mobile devices, the cloud, management software and other digital tools are constantly evolving and offer previously unimaginable solutions. In the first phase of the chain, the operating group Livestock Transformation 4.0 has been working since June to obtain genealogical traceability, breeding improvement, and livestock selection and the creation of algorithms for Decision making from big data. It is a supra-autonomous group that operates from Badajoz, Castuera, Madrid and Córdoba, and is represented by the company Cedesa Digital SL , a Extremaduran company that focuses its activity on the development of high-performance software aimed mainly at the agri-food and livestock sector. IFR offers your Meat solution & nbsp; D365 & nbsp; which includes internet of things, artificial intelligence, block chain, big data, machine learning and services in the Azure cloud. The computer software company Pccom , dedicated exclusively to the IT sector distribution of food and beverages, presented in Alimentaria its DistribERP program, a practical solution for distribution companies to manage the processes of any business area. CSB presents Linecontrol®, a software thanks to which the production and packaging lines are under control. WantorHave is an innovative online platform designed to accommodate members of the meat distribution chain. Its usefulness ranges from the farm or the slaughterhouse, to intermediaries, distributors, importers and exporters, commercial agents, cooperatives, etc. Aventics introduces the Smart Pneumatics Monitor that provides reliable information about the state of wear of the equipment, as well as the energy efficiency of its pneumatic systems, without the need to involve the control of the machine. This minimizes the risk of machine downtime and significantly reduces operating costs. Blendhub has positioned itself as one of the reference companies for facilitate innovation and internationalization of the powder-based food industry. If there is a sector that is usually in the forefront of technology that is the packaging. The need to offer maximum food safety, the search to extend the useful life of the products or the need to help through attractive packaging to consumers lead to companies specialized in packaging continuously developing new techniques and new products and products. put in the market. Atlantis Pak launched Amivac S , retractable bag with multilayer structure with Evoh & nbsp; which offers excellent barrier properties to oxygen and moisture to prolong the useful life of the products. Bandesur , committed to the environment, launched a range on the market of biodegradable plastic containers, suitable for use in contact with food and with the same benefits as traditional ones, so they are 100% recyclable. Becker has launched its & nbsp; rotary vane vacuum pumps U 5,300 for faster and more economical packaging. TexdaCol F es el resultado de años de investigación y desarrollo compartido entreTexda y BetexPack.Representa la evolución de los culares naturales conservando lo mejor de la tradición, avanzando hacia una producción eficiente para los embutidos curados de alta calidad. One of the technologies often mentioned in the meat and food industry today is that of high pressures. In this line, the results of the HP BLac project in which Hiperbaric participates as advisor and facilitator of HPP technology, were presented in Paris on November 20 with a great reception by attendees, mainly from the food industries. Bolloré has launched new films within its sealing range of Lidtec® trays. For its part, Busch continues with its R 5 rotary vane vacuum pumps, designed specifically for use in machines of vacuum packaging and fast packaging cycles. Cabinplant presents Multibatcher , a of the weighing and bottling solutions in the most efficient and innovative boxes in the world. Indesla , a company specializing in the manufacture of packaging for the meat industry , continues to expand its catalog with new formats for solutions in heat sealing (MAP). The new Evolution 300 Pro and Plus table sealers manufactured by Komet & nbsp; are distinguished by a particularly fast vacuum cycle and, therefore, offer many advantages, such as packing more products at the same time, serving customers more quickly or less in the kitchen. Proseal , distributed in Spain by Haratek , launch your & nbsp; tray sealer TTe , a small, compact and robust machine, ideal for low volume production and production trials. Tecnotrip presented the new & nbsp; EVT-28 G-TD desktop vacuum packaging machine , a machine of a great flexibility that allows to pack long pieces like salmon, loin embuchado, chorizo ... or small pieces in great quantity due to its high speed of packaging, since it is provided with two vacuum pumps of 20 m3 / h each. Viduca offers plastic packaging for food in different formats. Sealed Air has launched a new film in the range Cryovac® Darfresh®. With more than 50 years of experience in processing, slicing and packaging, GEA < / strong> offers its customers the exclusive OxyCheck & nbsp; system for the non-invasive analysis of residual oxygen, in all containers. Schur Flexibles presented its sustainable packaging at FachPack 2018 through recycling of valuable resources and avoiding waste FlexiClose (re) & nbsp; is an innovative packaging concept that offers optimal product protection, easy to use for the consumer, attractive and, of course, recyclable. Grupalia Pack G.Mondini led to the latest edition of Hispack Platformer , a team that allows you to build containers with a maximum of 2% plastic losses, reaching 10,000 containers per reel, with a quality above the current thermoforming machines in the market. Nutripack Ibérica has presented novelties, among which we should highlight the Thermoforming FS 950 complete. Last year, Multivac Marking Inspection featured the DP 230, a new generation of direct sheet printers for integration into thermoformers of the R 08x and R 1xx series. In the last quarter of 2018, direct sheet printer models for thermoformers of the R 2xx and R 5xx series are now available. Precintia is a Spanish firm with a long history in the field of the manufacture of security seals . It has for various sectors such as food, among many others. With them you can guarantee traceability, tracking a product from its origin and thus controlling the risks in the food chain. Segell Expres , has all the material that the food industry has precise for traceability. They design and manufacture safety seals for slaughterhouses, food industries, transport, etc. In addition, they are specialists in metal seals, bronze, aluminum, stainless steel with sanitary data sheet and in nylon. Among the latest launches of the company highlights a machine that allows the marking of products through laser technology designed to measure plastic products, choosing the designs and with the highest quality results. The equipment allows recording in both light and dark tones depending on the material or color on which it acts. Also this year has presented, in marking, the revolutionary Marked plastic tip , to stick in the leg of the hams . Logistics is one of the sectors that is advancing the most with the implementation of Industry 4.0. Companies understand the importance it has in the business and how a good logistics infrastructure can provide cost savings, efficiency and greater productivity. Big data, the last mile, ERP systems or robotics are just some of the innovations that are already being implemented. In addition, improvements continue on pallets, boxes or storage machinery with the introduction of new technology and materials. Smart-Flow recently introduced an innovation in this field with its Smart Sleeve Pack, a folding box-pallet & nbsp; of plastic of 1200 x 800 mm. The Pallet Dispenser & nbsp; from Qimarox allows both stacking and unstacking of empty pallets. The pneumatic movements are carried out in an effective and controlled manner, which guarantees optimal operation. The equipment accepts pallets of 2 and 4 entrances, both in wood and plastic. Ribawood , a leading manufacturer of plastic pallets, as well as boxes and containers , expands its manufacturing capacity with new technology and machinery of European origin to respond to the new projects it has for 2019 and in which the latest technological advances are required. MS Metalsystem launches a new loading dock system for the food industry designed to carry out the loading and unloading of goods, with a high level of insulation between the warehouse and the outside during its operation and when it is not operational. A key element in the meat sector are the ingredients and additives, both for the preservation of food and for flavor, aroma or color, among many other functions. This industry is constantly evolving to comply with the current regulations and the demands of consumers. Kancor has developed a natural antioxidant solution & nbsp; < / strong> robust, but completely refined, of rosemary. Anvisa , in response to consumer demand for a natural and healthy labeling, has designed a mixture " natural clean label " (Condimeat 978) free of allergens, E numbers and colorants, destined to the elaboration of pork burgers. Corquimia Industrial , distributors of additives, functional mixtures and more for the food industry, presents Blended Gel AS Plus, a high functionality natural flavoring for all types of emulsified products that can replace 2 parts of soy protein, 1: 5 meat and transglutaminase. Based on your extensive knowledge of the ingredients and their application capabilities in meat products, Proan da & nbsp; has achieved & nbsp; create a broad portfolio of & nbsp; allergen-free formulations and preparations . & nbsp; The company will soon start building a & nbsp; new pilot plant in its facilities that will be dedicated to R & D & i. & nbsp; In it, the clients of Proanda will be able to carry out the previous process to achieve a complete formulation for its meat products. Union of Producers of Paprika offers its bags of < strong> Pimentón de la Vera in 3 formats : 1kg, 500g and 250g and three types: bittersweet, sweet and spicy. Activa Food Tech , company dedicated to the development of customized food solutions , presents two product ranges ActiFree and Activegetales. Quality is an essential element in the food industry and, of course, in the meat industry. Many of the innovations introduced by technology providers focus on systems that allow products to be analyzed and quality parameters to be controlled so that there are no food safety risks or excessive heterogeneity in production, among many other functions. The Konica Minolta CR-410 colorimeter from & nbsp; Aquateknica is a portable instrument designed to evaluate the color of food and its variation . It is a precise and reliable equipment that helps users to control the quality and consistency of the color. The visual inspection system of Bizerba SliceCheck allows control 100 % of products sliced before packaging. The company also presented at Hispack digital cutting technology. Precise cutting, integrated weighing and the first cutter of its kind that is ready for digital transformation: all this is offered by the new series of VSI automatic cutters. Centralized device management, remote support or data analysis characterize the "digital cutting" theme for which the VSI series stands out. The system of Eagle EPX100 inspection by Last generation x-ray for food and other packaged consumer goods is safe, easy to use and smart. Lenz Instruments presents gmSCAN, a scanner of magnetic induction for the automatic classification of pig carcasses according to the Seurop classification scheme. 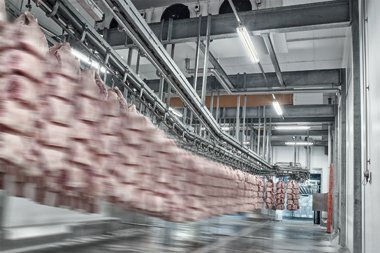 LGC Standards has launched a service that addresses the needs of quality laboratories for the meat industry, slaughterhouses and cutting plants. The services are accredited, thus complying with the requirements of certification (food safety) and accreditation (ISO17025). Dibal shows its broad range of & nbsp; solutions for Industry 4.0: simple software applications for productivity control by work stations in manual production lines, automatic weight controllers with excellent performance and easy to use by touch screen, high speed automatic labellers, detectors metals and x-ray inspection systems , industrial scales and scales, plus your & nbsp; improved management software DIS . In the subject of weighing, with an extra-flat design and a hygienic concept in stainless steel, the WPC platform Giropès is designed for environments with deep cleaning needs. The IP protection of its different elements allows to clean the scale with water under pressure without danger for structure, cells or connections. NDC Technologies , provider of process control and measurement solutions of precision, sees a growing trend among meat processors for the fat content analysis of meat from their combined batches of minced meat portions. Tomra introduced this year QVision, which is highly efficient since it continuously analyzes fat, protein, moisture, collagen and weight . It also allows registering the individual raw materials to keep a check on the suppliers that do comply with the required standards. Another of its systems is Tomra FatScan, which allows the continuous analysis of the meat to determine exactly the amount of fat contained in its composition. The cutting systems are of great relevance in the meat industry and must be precise, reliable and safe for both operators and food. Mainali offers your double-cut saw-tape Automatic RB-1 designed to work automatically and accurately, cutting accurately the default measurements of any frozen product. Seydelmann presents the K 1004 cooking cutter with 1,000 liter tank in stainless steel, vacuum installation and operation by means of a cross lever switch. Seydelmann is represented in Spain by & nbsp; Emo . Haratek, Spanish distributor of the line of Maja cutters , showed in FoodTech Barcelona the wide range of systems of brand. The principle FP of Maja is: portion of precise weight, high degree of homogeneity. Primedge introduces ; sharp Cozzini and Ergo Steel for meat industry and supermarkets. Weber Maschinenbau has developed together with SmartLock® a new quick-release fastener for the Weber Skinner blade holder, whose patent is in process. Cold is key in the meat industry, meat refrigeration is present in every process, from hatcheries, slaughterhouses, cutting rooms to conservation, transport and final consumer. The exposure of meat to the cold (refrigerating or freezing) is an efficient and very simple way to slow down the growth of bacteria, preventing the meat from deteriorating or being a danger to health. The conservation is prolonged and the preservation of the meats is ensured through the low temperature. The industry is continually working on improving its cold systems in different parts of the chain. Dawsongroup TCS (Temperature Control Solutions), present your & nbsp; < strong> Combi tunnels , with multiple functions in the same team. As a novelty, the Combi tunnels now incorporate the tempering function and the controlled freezing function. Isopan , company specialized in manufacturing insulating sandwich panels for facades and roofs of industrial and commercial buildings, Isofrozen has developed: a line designed for cold storage facilities and chambers, which manages to ensure high performance for the activity that takes place in this type of construction, and manages to maintain the cold chain. Johnson Controls presents York® Ylaa, a scroll-type chiller that It offers a cooling capacity from 190 to 530 kW and uses a refrigerant with low global warming potential (PCA), the R-454B. In 2018 Refrica has launched the new series of dryers for cured products, the ARV model, in which they incorporate the latest technological advances that allow the customer greater control throughout the room of humidity and temperature, a homogenization of the entire product, shorten the healing times and, without causing shortages . A new way of understanding the drying process of the products, being able to monitor the equipment in real time through a smartphone ... & nbsp; wherever you are.